Preheat oven to 300°F. Trim short ribs of fat. Season meat well and dredge in flour. Heat oil and fry short ribs until crispy and golden brown. Remove and drain. Pour off excess oil. Add celery, onions and carrots to pot the ribs were fried in. Cook while stirring lightly browned. Add a little flour. Deglaze pot with red wine, and then add tomato paste and tomatoes. When mixture has thickened a bit, add chicken stock, cloves, balsamic vinegar, cane syrup, garlic, thyme and rosemary. Bring to a simmer and season with salt and pepper. Return the ribs to the sauce. Cover and bake at 180 c until fork tender. Remove from oven, discard any bones, and refrigerate before cutting into portions. Strain mixture short ribs were cooked in. Skim fat off surface. Pour into heavy bottomed saucepan and simmer gently, reducing until mixture coats the back of a spoon. Mount with butter, season with salt and pepper. Combine sour cream, horseradish, Dijon mustard, lemon juice and hot sauce. Whisk to incorporate, then season with salt and pepper. 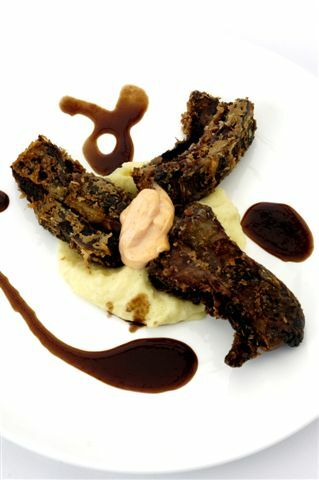 Dredge cold and portioned short ribs in flour and cook in canola oil until crispy on surface and soft inside. Season, and then position 3 pieces per plate. Ladle sauce around plate, then dollop Horseradish Sour Cream on top.